Thanks to the HSI method, Igli can enjoy a beautiful, natural head of hair for the rest of his life. 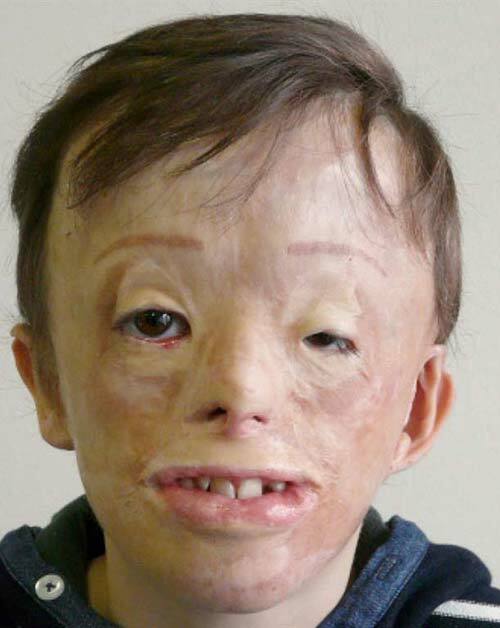 At the age of six months, Igli suffered serious burn injuries. 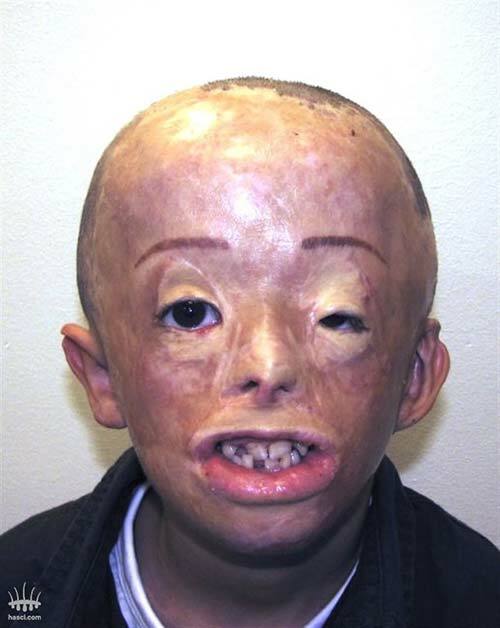 Second and third-degree burns to his body and head necessitated countless reconstructive operations over a period of more than seven years. The doctor treating him, Dr Cynthia Lafaire, plastic surgeon and head of the burns centre at the Stuivenberg hospital in Antwerp (Belgium), was looking for a way to restore Igli’s hair and found her way to Hair Science Institute. During the intake session with Igli, it became clear that the surface area to be treated was so large that several treatments would be necessary. 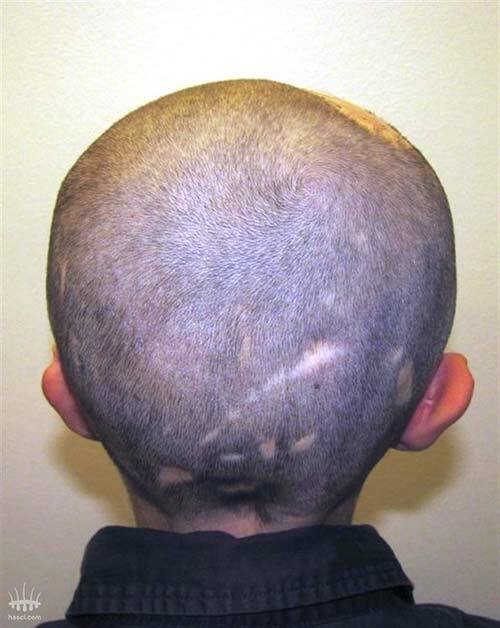 Igli’s donor area (the back of his head) was in good condition despite a number of scars and thus formed no obstacle to the plan to carry out multiple treatments. 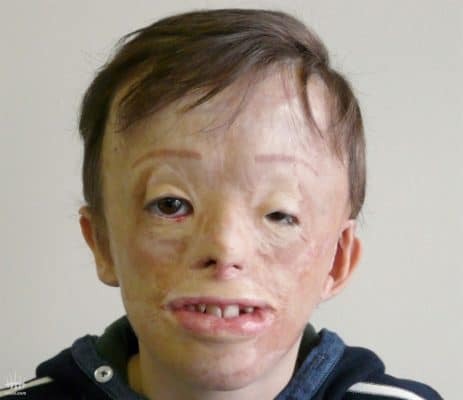 As Igli is traumatized by what he endured at a very young age, a very careful approach was required, and the pain-free treatment offered the only chance of success. It was agreed that his father, Dr Lafaire, and a staff member of the Stuivenberg hospital would accompany him during the treatments to offer psychological support. During the first treatment session, the hairline on Igli’s forehead was reconstructed. This was done to ensure better initial results than if the top of his head were to be treated first..
As a result of Igli’s enthusiasm following the first treatment, he could hardly wait to get even more hair. We were able to schedule a second appointment soon after the first, as we had not needed to use the entire donor area during the first treatment. This second treatment widened the hairline on the front and top of his head. This third treatment created as full a head of hair as possible. 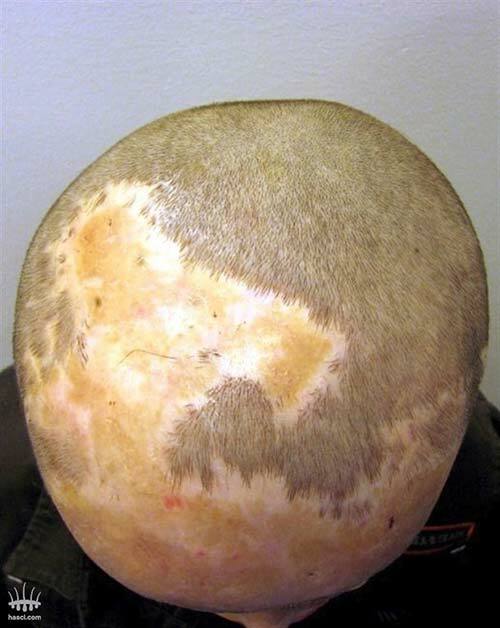 This third treatment resulted in sufficient hair growth on the scar at the front. Combined with the hair that he still had on his head, this resulted in a full head of hair, and Igli was able to say goodbye to the cap he always had to wear. During the final check-up, Igli remarked that he would very much like to have a sideburn on the left of his face and asked if he could perhaps have a few more hairs there. The fourth treatment was planned straight away. The result of this final treatment will be shown on the website in due course, as will photos of the fully recovered donor area after the four treatments. Monday 6 May 2013 saw Igli arrive for his fifth treatment at the clinic in Maastricht. As was the case in the previous treatments, this treatment was performed by Drs Kristel van Herwijnen. The treatment results can quite simply be described as outstanding, despite the fact that the recipient area was so badly scarred. The donor area has recovered completely, so any further cosmetic treatments at a later date will not be a problem. Igli Doko is assured of a beautiful, natural head of hair for the rest of his life. He is clearly very happy with it.